Congratulations Barbara on winning the ART ROSE AWARD FOR FINE ART! We have reviewed your on line gallery containing the virtual exhibit of Giuseppe Tampieri's paintings. drawings and sculptures - and decided to offer you this distinguised award not easy to achieve. Your web art gallery is excellent and the art is outstanding! ...we are proud to announce that you have won our BRONZE award in website design excellence. 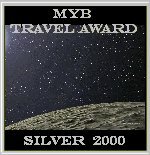 You can rest safe in the knowledge that we have no distinct criteria for each of our awards but we know what we like and we liked what your site had to offer. Good luck in all that you do and again, CONGRATULATIONS for all of your hard work. *** CONGRATULATIONS!!! 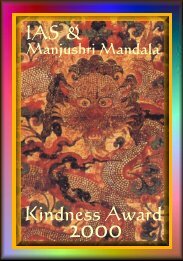 ** - For your kindness of inspecting our site or some other web-kindness we award you with our unique ***"IAS & MANJUSHRI MANDALA KINDNESS AWARD 2000"***. This is not an award one can apply for. May our Tibetan dragon-king ('drug dru') grant you even more wisdom, energy, success, creativity, health, prosperity and a long life. Cara Barbara, ti abbiamo visitato in 4 da cima a fondo e sei in ottima salute!! opsss.....scusa ci siamo confusi!!! dunque, abbiamo visitato il tuo sito e siamo giunti alla conclusione che un magnifico Queen Award non te lo leva nessuno!! Hello and congratulations! Your site "Barbara Tampieri Home Page" has won the jps-web.com Site of the Day award for March 20 2000! Your site will be featured in the daily newsletter sent out at the same time as this email to you and will also be posted in our winner archive at our site. Your work is outstanding but I didn't give you that award. I am awarding you site with my excellence award. I fell on your site, and I am glad I did. I showed it to my other two judges, and we all agree. Thanks soo much for your work. 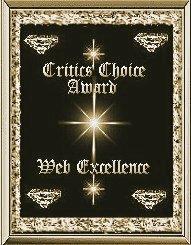 With great pleasure I bestow this award to your website. It has artistic flavour and substantial content. Congratulations, and hope to see your website improve.